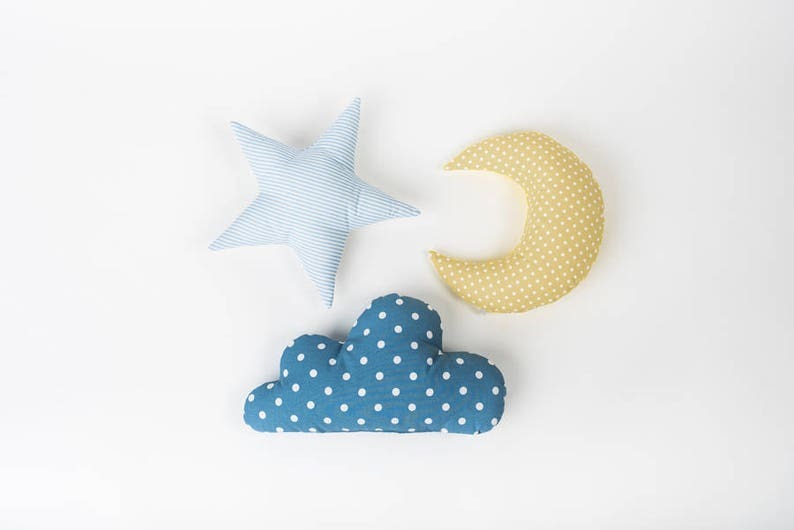 Set of 3 shaped pillows - Cloud Star and Moon. Pillows look nice in baby's room interior. 100% cotton is used on both sides of the pillow. - Moon: height 31 cm (12,2 inch). If you wish other colors or patterns, please ask. You may wash in machine at 30˚C and dry in warm tumble. Everything is crafted by hand. This is why it is unique and full of love! These are so cute! Love them, thank you for a great shopping experience! Everything looks nice and the pillows are well done, I just wish like the moon to be yellow as the picture shows, instead it is tan color. Please read the items description carefully. Most of my products are made on order to customers exact requirements, so please, be attentive by choosing complectation, colour and sizing. If for some reason you are not happy with your purchase, please let me know within 7 days after arrival - we would find a way out. Items can be returned or replaced. I accept returns only with First Class Priority Air Mail and Tracking Number and sent in the original packaging -- the original customs declaration MUST be visible. Then I can refund your original purchase price minus shipping costs. Or I will make and ship new item in correct size/colour/complectation, as soon as I will get the return package from the buyer. Buyer pays return shipping and is responsible for returning items in their original condition. The items will be shipped by registered post. Or you can choose a shipping upgrade for your items to be shipped by courier. Packages sent by courier take 2-3 days to reach their destination(do not forget to take into account the production time). Ready to ship items will be shipped 1-3 working days after payment. Made to order items will be made and shipped in 5-20 days. I am sending all over the world and all packages have registration number, they can be tracked in Post tracking system. Shipping takes about 1-2 weeks to European countries, and about 2-4 weeks to America, Canada or Australia by Post. During busy Holiday seasons shipment by Post can take longer. I am not responsible for items held up in customs in your country, all customs fees, taxes, tariffs, or receiving fees incurred. I am not responsible for any lost or damaged international orders once they have shipped under any circumstances. Colors you see on your monitor may differ from item colors. It depends on yours and mine monitors color profiles difference, so I cannot give you a guarantee that your monitor display the colors exact as they are.